We pride ourselves in being one of the best Cotswold 5-star hotels. Therefore, our Junior Suites offer plenty of space for you to relax and unwind. Each with their own unique interior design. 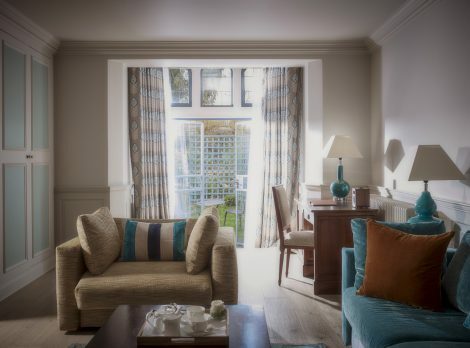 Not only do our suites offer exceptional luxury and comfort, they are also perfect for booking longer breaks in the Cotswolds. Featuring a king size bed handmade in Yorkshire by Harrison Spinks, thousands of pocket springs ensure the most comfortable experience. Every Junior Suite has a luxurious bathroom with heated floors and indulgent amenities from Molton Brown. Lots of delicious treats are waiting in your suite for you. Homemade biscuits & elderflower cordial, still and sparkling mineral water, Whatley Manor chocolate bar, coffee and tea making facilities. One of our lovely Junior Suites offers a sofa bed and is dog friendly. Please note we welcome children aged 12 years and over.